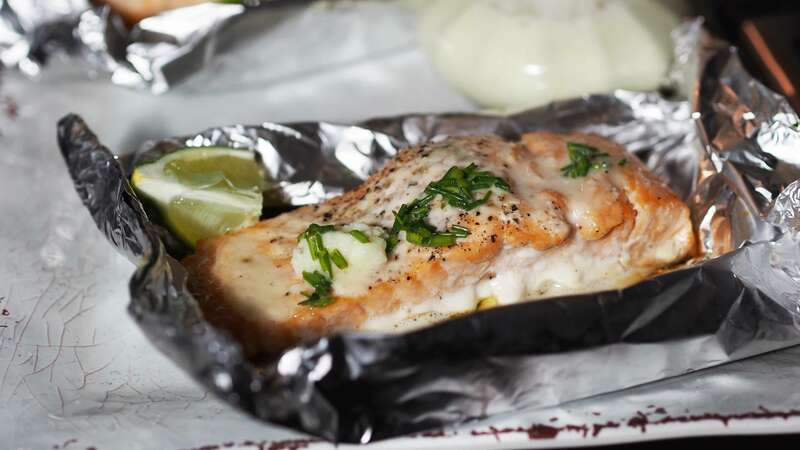 Place each piece of salmon on a piece of heavy duty aluminum foil; fold up edges of the foil around the salmon. Drizzle olive oil on top of salmon and add freshly ground black pepper. Grill, covered, over medium heat for 15 to 20 minutes or until salmon flakes easily with a fork. Puree garlic with lime juice, salt and pepper in a blender, or food processor, until smooth. With motor running, add melted butter and blend until emulsified. Pour lime butter over cooked salmon and garnish with chives.